Of course you can make your own charm packs by cutting out squares. 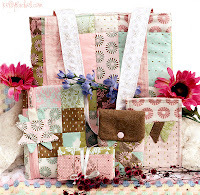 Drop over to Kelly's blog and read what you will need to make a great set of bags and accessories. She has listed what you need to get together to start sewing along with her over the next eight weeks. It should be great fun. That looks fun, thank you Vicki! Thanks Vicki... it sounds like so much fun! Ooooh, that would be useful to get a head start on my "Early Bird Christmas Gifts" ;o)!!! Thanks for the link :o)!! Thanks for the heads up! Looks like fun! Thanks for sharing,. I am going to go check it out now... have a great weekend. Wow this does sound like fun, thanks Vicki.